Used to hang projection equipment from a vertical pipe, City Theatrical’s Projector Hanger allows for easy removal and replacement of projectors without having to unscrew the pipe coupling. City Theatrical’s Projector Hanger connects 11/2” Schedule 40 Steel vertical pipes to projectors in a safe and efficient manner. The hanger provides a simple, one motion lock-in mechanism that eliminates the need to twist heavy projector equipment around a mounting pipe manually. 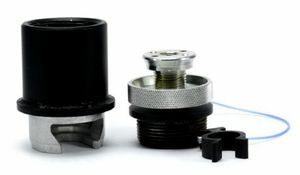 Simply attach the Projector Hanger’s couplings to the projector and to the pipe, then use the plastic clip to connect to the pipe threads and secure the projector at the desired vertical height. • Holds up to 300 pounds hanging straight down. • One motion lock-in mechanism eliminates the need to manually twist heavy projector equipment around mounting pipes while working at height.